Diana Abu-Jaber’s has been heralded as a writer that “gets it just right” and whose work “leaves readers breathless” (DianaAbuJaber.com). This well-deserved praise comes as the result of her award-winning style, captured in one food memoir, The Language Of Baklava (2007), and four novels: Arabian Jazz (1993), Crescent (2003), Origin (2007), and Birds of Paradise (2011).. Abu-Jaber lingers over words and experiences such that they leave an indelible imprint. She weaves together experiences from her own Arab American culture, the US multiethnic landscape, and her own logophilia. In a post-9/11 literary landscape, her creative offerings (and I use that phrase to invoke the food and meals she so richly describes) have been politicized both within and outside of the Arab American community. In what follows, Diana Abu-Jaber and I explore what inspires and limits her as a writer. We discuss the wide range of responses people have had to her work—from readers being ill at ease about Arabian Jazz for its depictions of Arab American characters, to winning the Arab American Book Award for Birds of Paradise. It should be unsurprising that she thinks of herself as neither constrained nor compelled by either reactions. Instead, she remains driven by a desire to write literature that speaks to the multiethnic, curious, quirky, and imaginative world she inhabits. TAP: You’ve published four novels and a culinary memoir, all beautifully written. Can you describe your writing process a bit for us? DAJ: Thank you! My writing process is always a work in progress. I’m never happy with it and am constantly tinkering, trying to find ways to settle down and do some writing. I do my best work—in terms of concentration and output—when I’m away from a computer. But avoiding technology turns out to be quite a challenge. I’ve resorted to writing my first drafts by hand and then hiring someone to type them for me. Then I’ll print out the drafts and try to edit them by hand. So the slowest part of the process might just be the phase when I actually have to enter the edits into the computer. That can take ages and ages. The Internet is my Scylla and Charybdis. TAP: What goes on when you have an idea? DAJ: It changes and changes and changes. I write things down, I try to catch my ideas in notebooks and scraps of paper, but half of them fly away or I write them and then lose the paper. It’s a very imperfect system, but of course, so are the ideas. If I manage to hold on to one, I might thread it into my narrative or use it to help shape an outline, but I might well decide that it’s not nearly so great as I thought it was the first time around and just toss it. Or store it in a little catchall file on the computer that I’ll call “extra stuff.” That happens a lot. TAP: And, what inspires you? DAJ: Many things: especially wonderful writing, strong images; lively, original metaphors and a vivid voice. Fiction or poetry. But also, the natural world, water, taking walks, city streets, travel, watching people, the weird oddball stories people tell you. When I’m in a creative place, it’s like getting sticky—things stick to me easily then and practically everything seems potentially fascinating and promising. TAP: The image of being “sticky” reminds me of kneaded dough and the way it sticks to your fingers. It is both pliable and stubborn. In some ways, it reminds me of the characters in Birds of Paradise and Arabian Jazz. How is the cast of characters in Birds of Paradise different from those in Arabian Jazz? How did those characters came alive for you? DAJ: I wrote Arabian Jazz so long ago, I don’t have as much of a clear memory of those characters. I remember that the situation—an Arab-American family in a rural, Central New York setting—was pretty autobiographical. 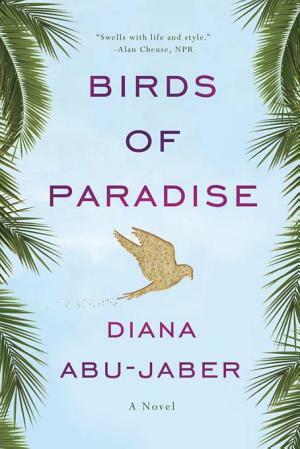 In contrast, the characters in Birds of Paradise grew out of their story. When I started, I had a mental image of a woman’s back and shoulders. I knew she was strong. Physically, I thought she was a baker, and I knew she was undergoing a deeply painful personal crisis, though I wasn’t sure what it was at first. I knew she wasn’t a warm and fuzzy baker, but someone with a little ice water in their veins. The other characters slowly emerged as I wrote Avis’ story, filling in the details. TAP: Avis strikes me as a complex, flawed character just as much as the characters in Arabian Jazz, but the response to her has been fairly favorable. On the other hand, there was a lot of controversy about Arabian Jazz. People thought you had violated this unwritten rule about what you could or couldn’t say about Arabs. What was that like for you? DAJ: I was pretty surprised, when Arabian Jazz first came out, by some of the extreme reactions to the book. There were so few novels about the Arab-American experience that people brought all kinds of expectations to their readings. Some were upset that it didn’t mirror their private story. Some thought it showed Arabs in a stereotyped way. Others felt it was anti-Israel. I can’t even remember all the reactions. It was my first book, so I was pretty surprised and often upset. It sometimes felt like a personal attack. Five books later, I’m getting better at dealing with that sort of thing, but still struggle with equanimity at times. TAP: In reading it, it seemed that a lot of the controversy had to do with depictions of race. In an interview, published in 2006, you point out that the racism you experienced and put into the book was very real. Do you find those scenes or moments difficult to depict? DAJ: It’s hard to write too overtly about racism without coming across as heavy-handed or didactic. But if you’re too subtle, there’s the sense that you’re side-stepping the issue. Still, I’ve learned to write about hot button topics in more oblique ways, mostly by looking at people’s “innocent” assumptions about each other. Like in Birds of Paradise, when Avis meets her Haitian neighbor, she automatically wonders if she might be the housekeeper. I think these sorts of loaded assumptions can carry a lot of information in a concise package. Readers can look at that and see the problem without having it spelled out. TAP: In looking at your novels as a trajectory, the spelling out of Arab characters changes. That is, Arab characters have fewer prominent roles, from Arabian Jazz and Crescent, which featured Arab American characters, to Origin where people’s heritage is largely unknown, to Birds of Paradise where there is a kind of vague Middle Eastern presence in the character of Hanan/Hannah. Was that deliberate? DAJ: I never intended to write solely about Arab characters, or even primarily about them, but because they were such a big part of my first two novels and my memoir, people reckoned that was my main literary terrain. It wasn’t really a deliberate decision to move away from Arab characters in my later books, but more a desire to paint on a broader canvas, one that was closer to my day-to-day experience. TAP: I’ve made those assumptions as well. Origin really disabused me of that because of its ethnic plurality. In fact, one of the aspects of each of the pieces that I particularly appreciate is the depiction of ethnicities other than blacks, whites and Arabs. DAJ: My father was Middle Eastern and I’m proud of my heritage, but I live a pretty multicultural/American life and the writing emerges from that naturally. TAP: So, do you envision yourself in conversation with other Arab-American authors? What do you imagine your works say to each other? DAJ: I teach Arab-American writers and love discussing their books in the classroom, but we’re all doing such different stuff. I’m not sure I see it so much as a conversations, [but] an ongoing appreciation of their work. I have to admit, I don’t make a specific study of Arab-American writers, but if I hear that Khaled Mattawa or Randa Jarrar or Joe Geha has a new book out, I’ll be as quick to get it as I will to get the latest Michael Ondaatje, Annie Proulx, or Zadie Smith. TAP: I want to switch gears for a moment and think about your link with Arab Americans in the public eye. For instance, Crescent was written well before 9/11, but it was published at that time. Part of the way the novel (was? Continues to be?) received has to do with the way people consider it as part of a conversation about 9/11. How do you think your book contributes to this, if at all? DAJ: If Crescent contributes at all to that subject, I hope it’s in terms of that seemingly elusive “humanizing” people talk about. I think of Crescent as an acknowledgement and celebration of Iraqi /Arab food, music, people, done through an American lens. TAP: So, do you consider political events (9/11, Gulf War, War on Terror) integral to your writing? Why/why not? DAJ: I find politics generally pretty stifling, and one of the ways that people of the Middle East, as well as people of developing or so-called third world nations are diminished is by constantly being viewed as political entities. TAP: I agree. I often wonder how that stifles conversations between American authors. How do you see your writing dovetailing with other American writers? Do you see your writing in an American context only or in a more global one? DAJ: I’d love to think of my work as more global in nature, but America is so insular, it’s hard to see the outside when you’re writing from within the belly of the beast. Still, I love the topics of identity and the search for home, and for me these questions seem to require travel and exploration. America is not the final word. Therí Pickens’s research focuses on Arab American and African American literatures and cultures, Disability Studies, philosophy, and literary theory. She authored New Body Politics: Narrating Arab and Black Identity in the Contemporary United States, which asks: How does a story about embodied experience transform from mere anecdote to social and political critique? Her critical work has appeared in a host of journals including: MELUS, Journal of Literary and Cultural Disability Studies, Disability Studies Quarterly, Hypatia, and Women & Performance. She bowls. She loves fashion. She is an avid watcher of Food Network’s Chopped, and consumer of culinary delights. You can find her at her website (www.tpickens.org) or on Twitter (@TAPPhD).